ID: Bright red coloration. Five equal length arms. Small flat round raised lumps on disk and arms. Comments: I often note this interesting seastar on soft substrates. 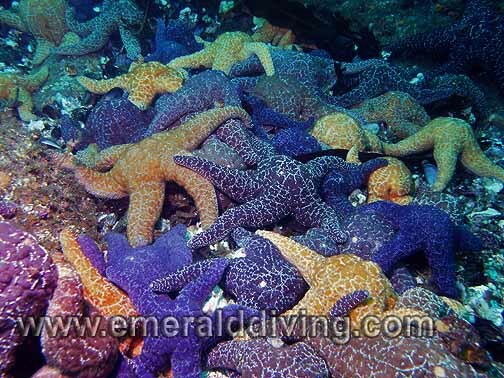 Vermilions stars are readily abundant in the deeper reaches of Three Tree Point. ID: Five long, thin rays. Typically solid red or orange, although disk area can be a lighter color. Comment: Distinctive bulging rays with web-like flesh between the rays. Coloration can vary greatly. Typically only found along exposed shorelines. Note this specimen has 6 rays - not the tradition 5. 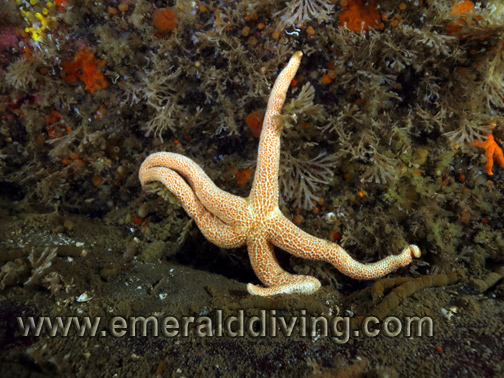 Photographed at shallow depths (10 feet) in Browning Pass, BC. ID: Five short, thick rays. Thick body. Color varies and includes tan, grey, and yellow. Often has patches of brown. 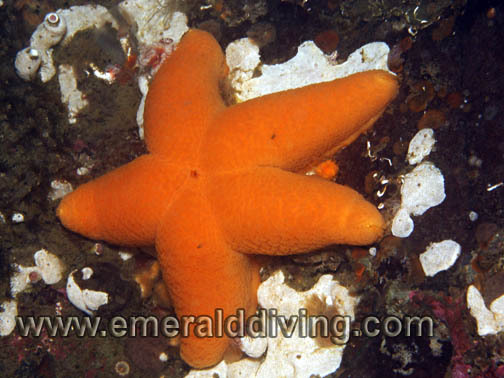 Comments: I only seldomly note this soft bodied seastar when diving rocky reefs, although I have noted it throughout Washington waters. 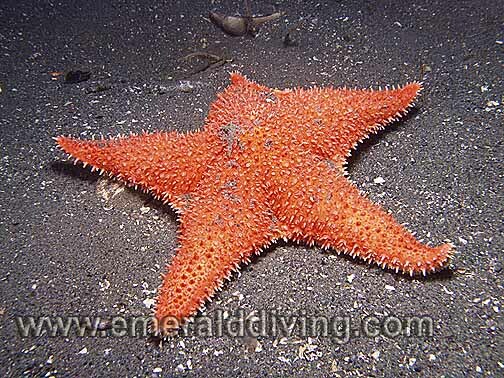 My dives at Blakely Rock and Sunrise Beach usually produce at least one cushion star sighting. ID: Five thick rays. Thick body. Grey color with patches or brown/orange. 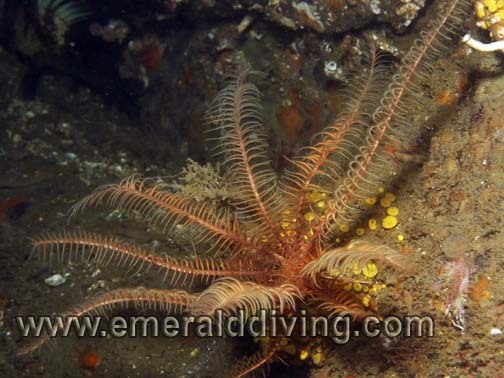 Comments: The leather star is another common five-armed inhabitant of our waters, and known to target the poor orange seapen as prey. 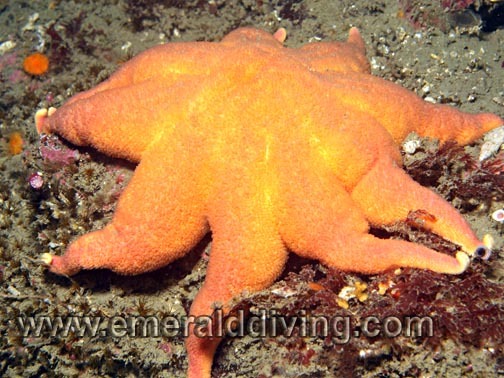 This soft bodied seastar excretes an undesirable mucus when threatened, which has resulted in it also being known as a slime star. ID: Five long rays. Typically orange or brown color, but can also be grey or blue. 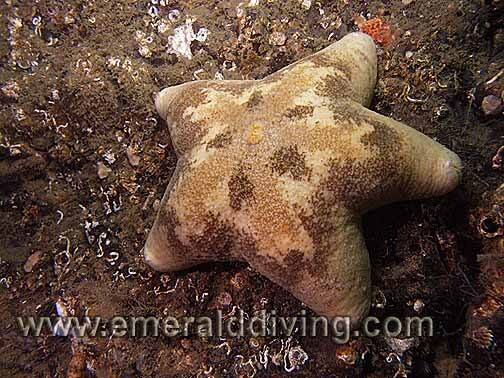 Comments: I often note the mottled star when diving reefs. Like the ochre star, the mottled stars has rows of tiny sharp white teeth lining its tough exterior to discourage would-be predators and hitch-hikers. ID: Five long rays. Typically gray or black. Thick clusters of rough tufts along arms. Comments: I only regularly note the long ray star when diving Hood Canal. This unique seastar has rough ball-like armored clusters lining its arms and body to deter predators or free-loading hitchhikers. ID: Typically yellowish-white to tan body with darker brown arm tips. Orange colorations noted in the Canadian Guld Islands. Thick arms - typically 12. Comments: The morning sunstar is fairly common throughout Washington waters. 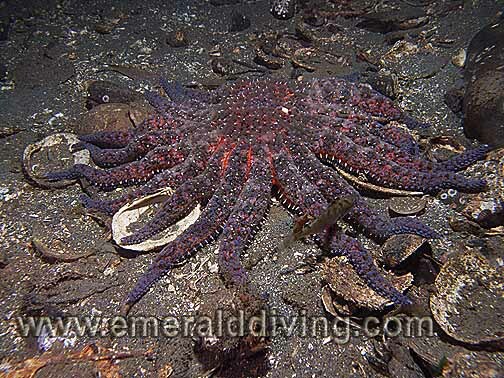 This seastar is known to be a veracious predator and will attack and devour seastars much bigger than itself, including the sunflower star and other morning sunstars. Despite its ferocity, the morning sunstar has a soft body. ID: Five thick arms. Solid body color includes purples, oranges, and browns. Rows of small, rough white �teeth� on arms and disk. Comments: Ochre stars are found at various depths, including above sea level! These very abundant seastars are often seen by beachcombers clinging to pilings or rocks at low tide. The ochres stars tough exterior is complimented by rows of tiny sharp teeth to discourage would-be predators or hitch-hikers. ID: Five long arms. Pink to white-pink color with a hard exterior. Comments: Pink short spined seastars are anything but short. 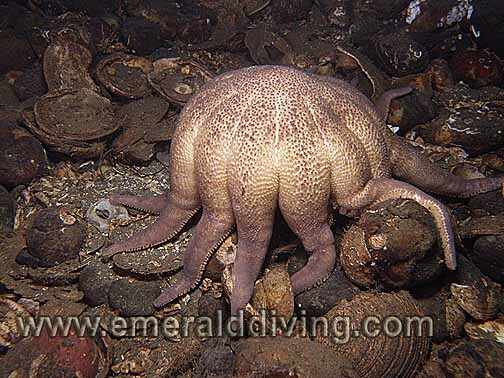 The seastars are abundant throughout Washington waters and can grow very large. I find these seastars on rocky reefs and cobble substrates. The Pink Short Spined Star is a slow mover and usually has a "humped" disk. ID: Five long and flat rays. Brown to gray with white along perimeter of arms. Comments: I only note this rather bland seastar admidst soft and otherwise barren substrates. Because of its choice of habitat, this species is sometimes referred to as a mud star. ID: 9 or 10 long rays with purple/blue stripe. Bordering color can vary and include red, yellow, and purple. 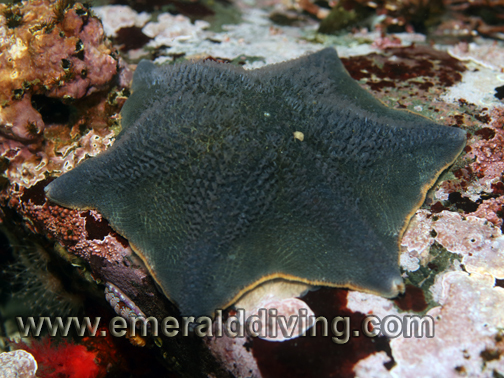 Comments: The elegant looking sun star is known to feed on a number of invertebrates, including sea squirts and sea cucumbers. 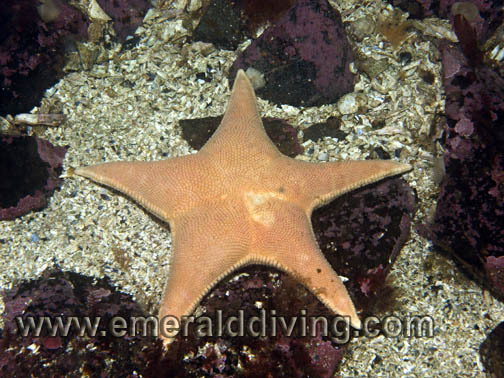 I commonly note the sun star on reefs in all Washington waters. ID: Solid orange color. Five thick arms. Prominent spikes covering entire topside. Comments: I often note the spiny red star on soft substrates. This species is known to prey on the orange seapen, which also thrive on soft substrates. 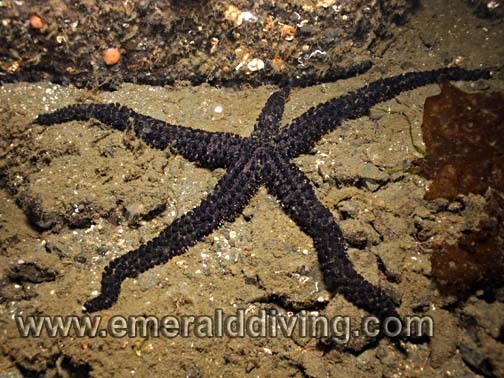 The largest specimen of this seastar I have found have been at the Shilshole Wrecks. ID: Typically 8-16 rays with purple, red, and pink, concentric rings. 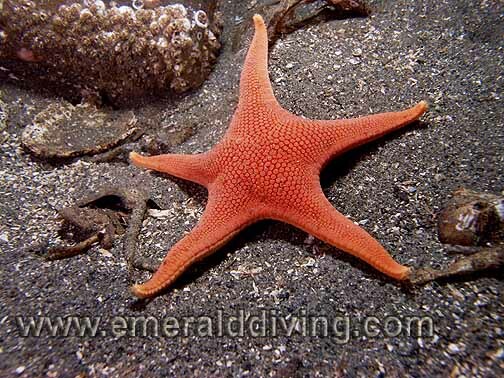 Comments: A striking seastar, the rose star is fairly common throughout most Washignton waters. I usually find this species on soft sustrates near reefs. 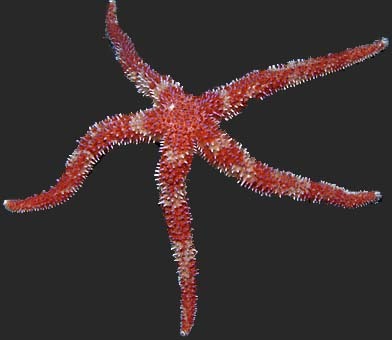 The rose stars body is covered in short pointy spines. ID: Orange with varying degrees of purple orange. Approximately 22 rays. Body is very soft. 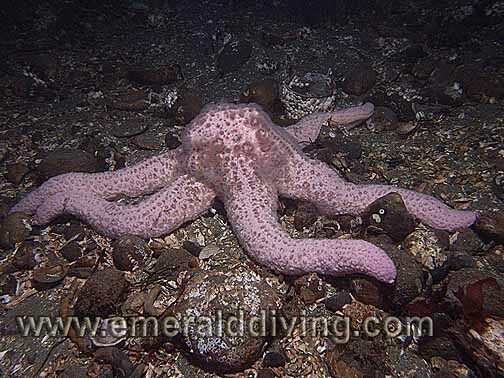 Comments: The largest and fastest seastar in the world, this Northwest giant runs like banchee on its tubed feet when in close proximity to a morning sunstar. 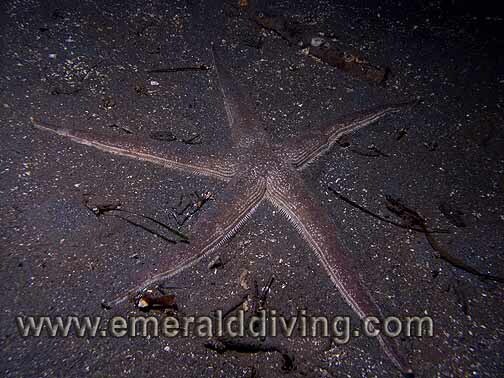 Sunflower stars are extremely common through Northwest waters and are known to excavate large holes in search of clams. 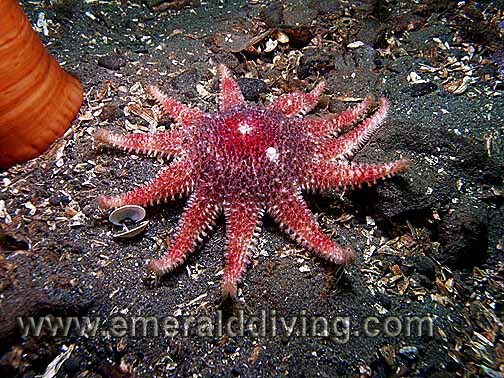 Like many seastars,the sunflower star also expels its gut when it eats. ID: Five rays with protruding white or purple spines. Mottles orange and white body. 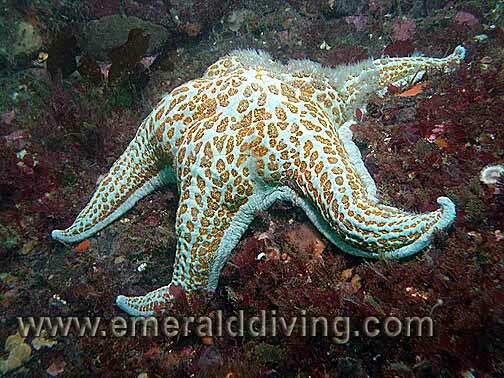 Comments: I wouldn't call the painted star uncommon, but I don't often note this colorful seastar. When I do, it is on rocky reefs. Specimens in the San Juan Islands are often larger and thicker than specimens I find in Puget Sound. ID: Five thick arms, wrinkled exterior with a large pore on top in the center. Orange to pale yellow in color. 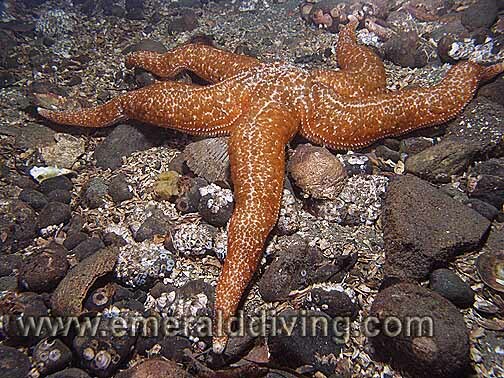 Comments: Very rarely noted seastar in Washington water, more often noted in Canadian waters. 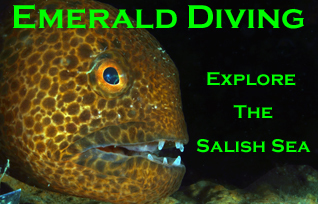 Feeds on sponges and hydrocorals. Comments: I have only noted these wonderful creatures in the Canadian Gulf Islands up to Nanaimo. The feather star uses its arms to filter plankton fro the current. When disturbed, this animal can actually swim, or more appropriately "dance", through the water column. Photographed in Tumbo Channel in the Gulf Islands. ID: Approximately 9 very chick, puffy arms that taper at the end. Orange-yellow coloration. 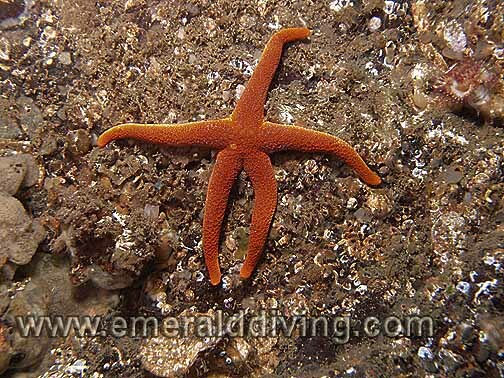 Comments: This is a fairly common seastar in the northern San Juan Islands. 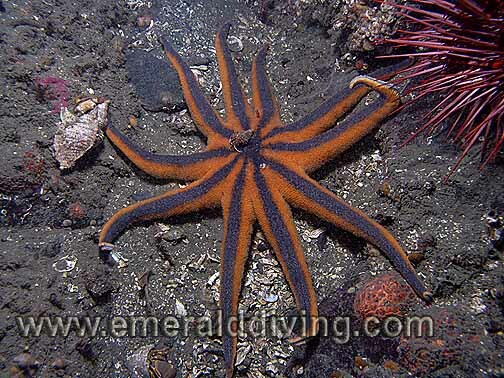 This seastar is known to prey on sea cucumbers. Photographed near Turn Point, Stuart Island. ID: Five thick, puffy rays outlined in prominent plates. Orange to pale orange in coloration. Similar in appearance to vermilion stay, but much bigger and thicker. 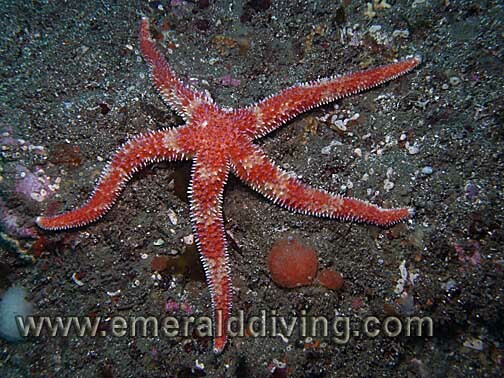 Comments: I have never noted this seastar in Washington waters. I had to go to Browning Pass to find this specimen, which was photographed in Lucan Channel. Known to feed on anemones. ID: Five rays. Color varies from yellows to purples to reds. Distinctive lattice on the surface of the rays. Comments: I often find this species in British Columbia, but not Puget Sound. Size and color can vary greatly, but the intricate lattice weave pattern on the top side of this stars rays make it easy to identify. Photographed at Tumbo Channel in the Southern Gulf Islands, BC. Comment: This very abundant seastar is believed to feed on sponges. I typically note blood star on throughout Washington waters on current swept reefs where sponges thrive.